Laws can change attitudes, and changed attitudes can change how we act. The other day, I saw a tweet from Ethan Marcotte that puzzled me. It wasn’t really because of the question, because such a gallery would be great. Instead, I noticed how unfamiliar and bygone the idea “accessible means ugly” was to me. Why hadn’t I had to deal with these kind of discussions the last years? I believe we went from “accessible or beautiful” to “accessible and beautiful” thanks to the law that made inaccessible websites illegal in Norway. Ok, so how illegal is it? Principally, all websites, be it from the public or private sector, that were (re)designed after 2014 have to follow almost all of the A and AA criteria in the Web Content Accessibility Guidelines’ 2.0 (except 1.2.3–1.2.5). How DIFI explains their work. Apparently, few countries generally require private sector websites to follow the WCAG criteria. I’m not sure how these regulations are enforced in these countries (would love to hear about that in the comment field). When a website doesn’t follow the criteria in Norway, it can have actual consequences. The law is enforced by the state agency DIFI, which makes random controls, typically at large companies. The report is published on the DIFI website, and the company gets a fix list with a deadline. But what if they don’t comply? In 2017, major Norwegian airline SAS launched a redesigned website. In November 2017 the verdict from DIFI came: SAS failed on so many criterias that DIFI said the site was “impossible to use”. If SAS didn’t comply, they would be fined. In August 2018, SAS still hadn’t fixed all of the issues, and DIFI decided SAS would have ten more days — if they didn’t fix all the issues they would be fined roughly €15.000 per day. Even from the beginning of the SAS debacle, WCAG criteria were suddenly making headlines! Several major Norwegian newspapers were writing about the critique SAS received. “SAS-website fails”, is what VG, Norway’s largest online newspaper wrote. 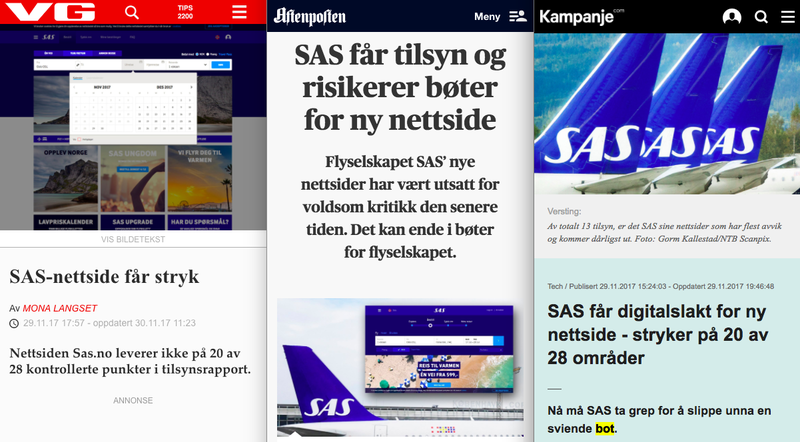 “SAS risks fines for new website”, wrote Aftenposten. “SAS is slaughtered for their new website”, wrote Kampanje. In the meantime, SAS competitor Norwegian Airlines has had a field day. SAS couldn’t say that “well it’s difficult to make airline websites accessible”. The Norwegian Airlines website looks modern and has won several design awards. But when they were controlled by DIFI a year before SAS, they received just a few minor comments. 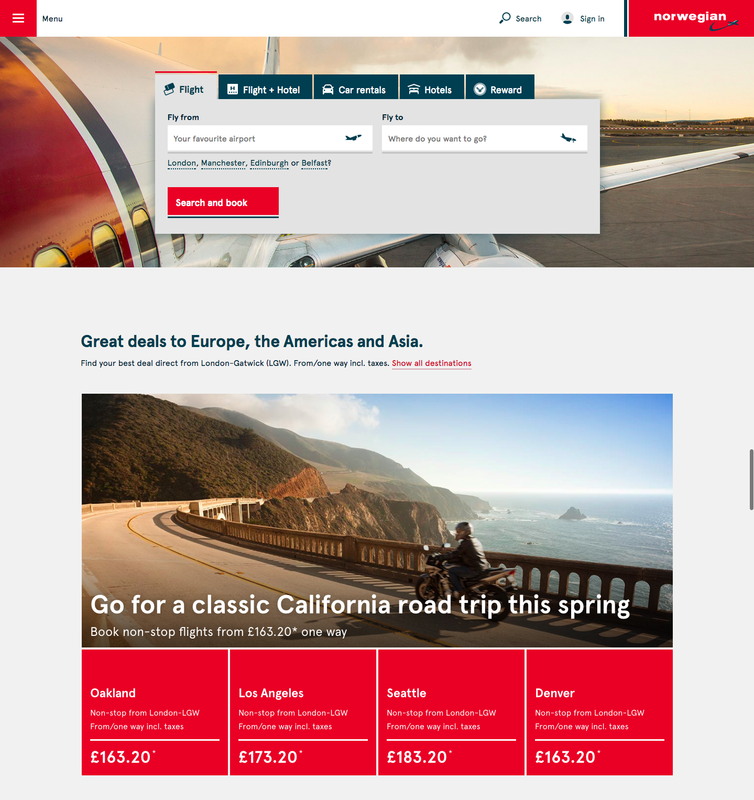 The Norwegian Airlines website is modern and has won several design awards. That doesn’ t mean they didn’t consider accessibility. Bad accessibility has become bad news. On the other hand, when someone has made an effort to make something accessible, they’re proud. Online grocery store Kolonial.no collaborates with the Norwegian Association of the Blind and Partially Sighted, and uses the collaboration in their PR work. In this video Bjørn Roger Trollness demonstrates how he uses the Kolonial.no app with voiceover. He’s a representative from The Norwegian Association of the Blind and Partially sighted. The video is in Norwegian, unfortunately not captioned in any language. When I worked with the Norwegian Association of the Blind and Partially Sighted, our goal was to reach as many AAA criteria as possible, and not just the AA criteria required by the law. We wanted to show that even higher accessibility criteria wouldn’t mean an old-fashioned or boring website. How can a law change the conversation? Firstly, a client would never say something like “Well, blind people aren’t really in our target group”. Because the law holds the client responsible, the client then holds the agencies responsible, and are now asking about guarantees that the new site upholds the accessibility regulations. Secondly, when a colleague suggests a solution that isn’t accessible, there are no if’s and but’s when you can simply say “Well that would break the accessibility law”. Accessibility and aesthetics aren’t seen as opposing qualities. The conversation run more along the lines of “Yeah, but how would that work with a screenreader?” or “Cool, how could we do that in an accessible way?”. And you won’t get an eye-roll as a response. You’ll get a suggestion. 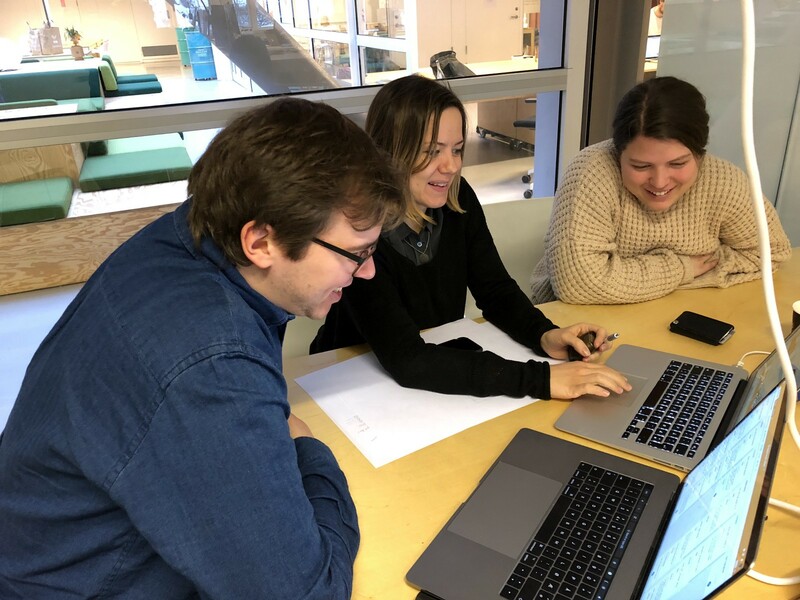 When working on The Great Norwegian Encyclopedia, we did accessibility user testing to improve the site. In the video above, you see a user that has 1% vision, and uses inverting of colors and zoom to navigate the site. The video has no sound. Asking about the accessibility has lead us to simpler, more elegant and usable solutions for everyone. If it’s complicated to make something accessible, that’s often a sign that the design or idea itself is just too complicated. The Confrere team on one of our accessibility and usability walk-throughs. From left to right: Dag-Inge Aas (CTO), me (CPO), Ingvild Indrebø (Senior developer). The accessibility law was not controversial. It was supported by both the industry and NGOs, and a unanimous parliament voted for it, from left to right. Even anti-regulatory parties recognises that it’s sensible economics. According to Norwegian statistics, 15–20% of the population have some kind of disability. As our population ages, the proportion will be even higher. At the same time, everything is becoming more digital. Taxes, tickets, shopping and news are all digital. If you create a system where people with disabilities are shut out from doing these very basics things, you are not only lessening their quality of life, you’re also likely to increase costs for both society and private companies. If people can’t do it online, they’ll have to call your company, or send a physical letter, or even show up at your office. That’s not cost-effective. Being able to navigate the site with a keyboard is great for my mom who has Parkinsons, but also great for my brother when he had tendinitis. If you caption the videos, that’s great news for the hearing impaired, but also great when I’m on the train without my headphones. Good readability is great for the visually impaired, but also something I’m really grateful for when I forgot my reading glasses at home. Good semantic HTML is great for the screenreader, but also for your SEO. The clean, nice code that follows standards works better with accessibility tools, but it’s also a lot more future-proof. We need more examples of large-scale, commercial websites that abide by these principles. But to get there, I think regulation is the right way to go. You can have aesthetics and accessibility at the same time. It’s just a matter of focus.